A gift to the family to honor a WWII veteran. I bought this case for a 5' x 9.5' veteran's burial flag. The wood has a nice rich color to it. A nice display, and safe storage. My first ever to puchase, and Walter Drake provided such an item. My Dad's military flag fits perfectly into this display box. The brass plate can be clearly read. My husband is a vet and I got this for him to put his dads flag in. I got it for him for Christmas so we can display his dads flsgs with pride. This flag case was bought, to put my husband's grandfather's military funeral flag in. I was very impressed that WD offered an extra line of engraving, and to be able to put his last ranking-Brig.Gen., next to the branch of service. It is of good quality for the price, and will be displayed in the living room, next to a potrait of him. Arrived promptly, note that the engraved plac is on the outside of the boxes with the packing slip. Freedom fighters from the past! I am very pleased and it is a perfect fit for a large flag. This product only has one use and it's perfect for that use. I have bought and seen others that were more expensive and were not nearly as attractive or well-made. I am very pleased with my purchase. I got this as a gift for a family member who's father (my grandpa) served in WWII. The price if fair, they shipped it quickly, the quality appears to be good, despite it being made in China. The sticker on the bottom is annoying, i scratched the wood on the bottom of the case trying to get it off. I recommend not messing with it. You won't be able to see it once it's set up anyways. The printing on the golden name plate is not as pronounced as some may want but I'm happy with it. Some assembly is required. I name plate has a sticky back that you put on yourself. You also have to unscrew the back to get the flag in the case. You also have to screw on the two feet on the bottom. Directions are included. Excellent for the job it is made for. My family is extremely pleased with the flag holder. The product is used as a memorial for our Father who served in WW11. It took a while for the product to arrive, but it looked nice for it's purpose. Haven't put the flag inside yet, so I don't know if it fits well. Certainly hope so. The case looks good and so does the plate. It would be nice to include instructions on how to fold the flag in a triangular shape. I bought this for my Grandpa's veteran funeral flag. He died in 1963 & we just recently found it. The case & engraving plate turned out so very nice; we are very impressed! I do wish there would have been a choice between a silver engraved plate or gold though. Gold was the only option & we like silver better. Also, it would have been a nice touch to include instructions on how to fold a flag, but that can always be looked up online. Great offer for deceased veterans familes. I ordered it to display my father's flag, as it matched the one he had for his father. It came with the instructions how to open it INSIDE the flag case, and the engraved name plate never made it on the case, nor was it anywhere in the box. I am upset, as that was one of the reasons it was supposed to take so long to ship, yet it didn't come as promised. I ordered 2 units one arrived damaged. But overall the product is good for the price paid. The wooden case arrived in good shape but the plastic 'glass' arrived with deep scratches. Customer service would replace, but not practical given case needed for memorial event. Customer service offered $10 store credit, useless. Order with caution, good chance of defects. Had to return it due to cracked plastic where screws were used to attach to wood. New one was OK. I can't believe none of the reviews talk about the paper tape on the front and back of the glass, it's impossible to remove. 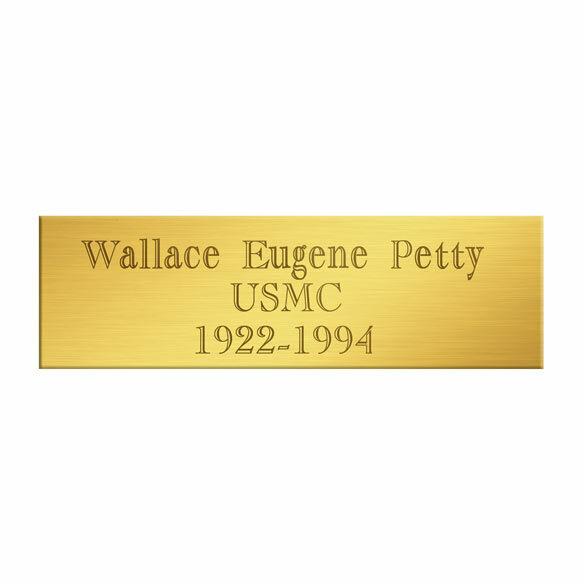 Name plate engraving isn't deep and pronounced enough. Finally found the nameplate on the front of the shipping box after reading other reviews here. Very sad with my purchase. Wanted to honor my dad with his flag and this surely isn't the way. Son is retiring from Army after 20+ years and this is to display a flag from his Grandfathers casket. Have ordered item in years past and was very satisfied with the product. Price reasonable. Competitive Price of Quality Product, along with shipping perks. This was purchased to display the flag given to me by the US Navy when my husband passed away. This is for the flag from the casket of my son. I wish to display it nicely in my home. My niece passed away few weeks ago. I buy it for her son holding her USA flag. My husband passed 6/30/16 with a Navy funeral he so deserved. He served his country, was a great husband and father. Our family is so proud of him and will be pleased to display this tribute to our hero! To store my late husband's flag dust free and safely. SUCH A GREAT WAY TO HONOR THOSE THAT HAVE SERVED OUR COUNTRY! I chose this flag case - the deep wood color makes the flag stand out in its rich color. Good price, clean lines, personalizable. It was the lowest price I found anywhere. Brother in Law Howard passed away. I ordered this for my sister for his Service Flag from Coffin. Nice looking and personalization was included. Have ordered before and was very happy with this item. For the flag presented to me at my father's funeral. This will be shipped periodically between my two brothers and me. serving his country. I needed a casing for it so I could put it next to his picture. My Husband, Stanley, who was an Army veteran just passed away and I needed to get a Flag Case. For my mother in law. She just lost her husband who was buried with military honors. What size flag does this fit? BEST ANSWER: I would like an answer to this question too. "Standard" isn't specific enough. Does it fit 3x5 or 4x6 or 5x7 flags. It will fit one size best, not all. Thank you for your question. 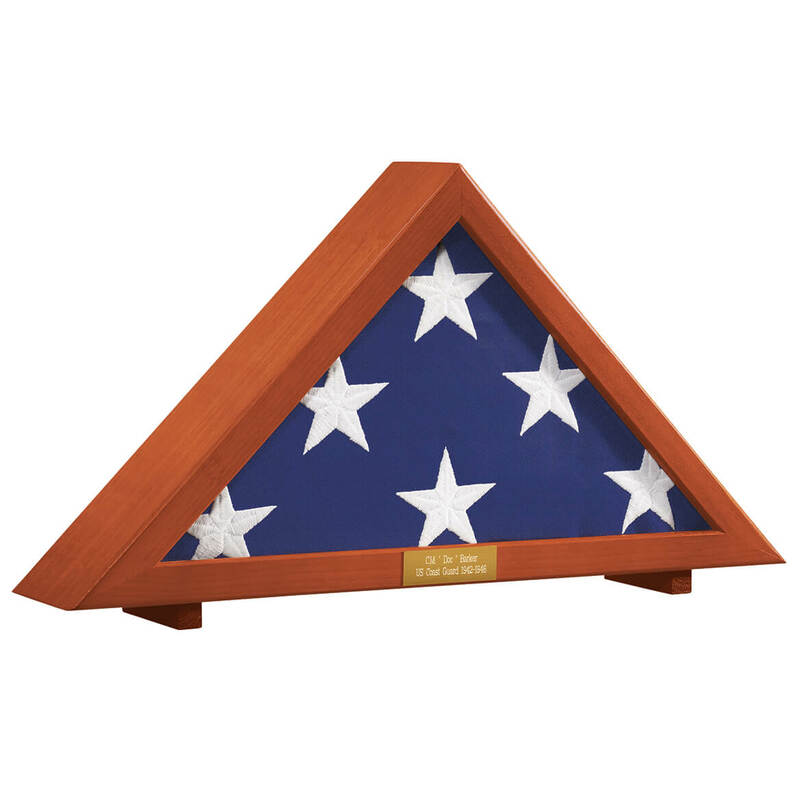 The Flag Display Case will only hold a standard size flag. We hope this information will be of help to you. Does this come in size for a 3x5 flag? BEST ANSWER: This will accommodate a standard flag that is folded and presented to family at a military funeral. I didn't measure the flag, but I assume that's the size you are referring to? I was very pleased with the quality of the box. Hope this helps. The flag was on my fathers casket so I assume it was a standard size flag. Military folded the flag & fits perfect in the case. Does this Flag case have glass over the case front? BEST ANSWER: Yes, well it's Plexiglas. It is really a nice display & the gold label just adds to it. It's not glass. It's a thick clear plastic. BEST ANSWER: Yes. It's wood and glass. The dark wood is much more attractive than the light. The light is very "yellowish" looking. In fact, I just ordered two more. Yes it's wood. Nice looking. I'm happy with mine. how do i open the case to put the flag in? BEST ANSWER: As I recall there are Phillips screws in the back. You unscrew the back, place flag inside (tight fit), then replace the back and screw it in. Hopethis helps. As I recall, the back has little hinges that turn, like a photo frame. read directions - open the back of case and take apart to enter flag. Can this flag box be hung up on the wall? BEST ANSWER: No. There is no hardware on the back of the display case for hanging. Where do I type in the personalization? BEST ANSWER: Once you have added it to your cart , go through the steps and it will give you the area where you put in that information, it will even let you review it before summiting it for order. I hope this helps. I was very pleased with my purchase. Thank you for your question. You will need to select plain or personalized. Once personalized is selected, it will ask to be personalized. We hope this information will be of help to you. On the order form there is a place to write the persons name and any other info you want put on the name plate. The plate is engraved and sent to you along with the flag display. Where do put info for personalized plate? BEST ANSWER: Thank you for your question. You will want to select to personalize in the drop down box. Once selected, click on the green personalize button and it will ask for the personalization. We hope this information will be of help to you. once you add it to your order, it will give you the area to fill in with the information you want on the name plate. Does the flag case come in Mahogany ? BEST ANSWER: Thank you for your question. This item is made of Made of castanopsis spp. which is a variety of chestnut and chinquapin. Chinquapin nut tree wood is a solid wood. We hope this information will be of help to you. Where is this case made? I am looking for one made in the USA, not China, etc. Thank you for your question. This item is made in China. We hope this information will be of help to you. BEST ANSWER: Thank you for your question. Unfortunately we do not carry just the plaque. We hope this information will be of help to you. BEST ANSWER: Thank you for your question. I do not know of any cases that are air tight, perhaps you can seal the seam with glue or epoxy. We hope this information will be of help to you. this is what I want but not personalized. Do you have that? BEST ANSWER: Thank you for your question. You can choose not to personalize this item. The plaque comes attached to the invoice so you do not have to attach it if you do not want to. We hope this information will be of help to you. What type of wood is this made of? BEST ANSWER: Thank you for your question. This is made of castanopsis spp. which is a variety of chestnut and chinquapin. Chinquapin nut tree wood is a solid woodWe hope this information will be of help to you. Dark and Plain Dark where can I see the two choices or please explain? BEST ANSWER: Thank you for your question. The picture that is on our website is the dark. The difference between the dark and the plain dark is that the plain dark does not come with the customized plate. We hope this information will be of help to you. Which finish is shown in picture? BEST ANSWER: Thank you for your question. This item is only offered in one finish option, the dark. The dark is what is shown in the picture. We hope this information will be of help to you.